Huguenot silver was fashioned in London by several hundred French craftsmen. From regional French cities, Blois, La Rochelle, Metz and Rouen, discover how the British metropolis provided an exciting new arena for the French court style in cuisine and hospitality. You will learn how skills were transferred to native goldsmiths, the Huguenot network across Germany, The Netherlands and Switzerland provided an international market. Huguenots produced new-forms of domestic silver for dining and display; helmet-shaped ewers or lavish epergnes and small-scale accessories. Gold boxes, ivory cane handles, and miniature portraits fed the demand for adult ‘toys’, beautifully cased watches and scent bottles. Their reputation attracted leading contemporary patrons. Generations of subsequent collectors ensure that silver marked by Pierre Harache, David Willaume, Paul Crespin, Paul de Lamerie, and Nicholas Sprimont is still treasured today. 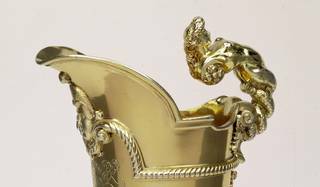 Historical background, handling and tasting sessions and visits to other London collections will demonstrate the enduring interest in the work of Huguenot craftsmen.